One of the core skills a good paralegal will possess is the ability to perform proper legal research. Legal research can include traditional research methods as well as using the internet to find the information for which you are looking. If your legal research skills could use some brushing up, here are some online resources to help you perfect your legal research skills. This online guide is designed to help beginners with everything from definitions of basic legal research terms, as well as how to get started with actual investigations. This document is very well written with phrases linked to other areas of the guide that give further explanations of key points. While aimed at law students, this guide is for all legal professionals who want to know more about how to perform proper legal research. The guide starts with the basics of legal research, then moves on to the actual processes that can be used to begin your research. If you’re looking for a step-by-step breakdown of legal research, this tutorial is for you. The process of legal research is broken down into 10 easy steps designed to help you begin, even if you’ve never done investigations of this type before. This PDF is Chapter 3 of the ebook “Locating the Law.” This instructional document goes beyond the basics and digs into more details such as the TARP method of approaching legal research. There is also a list of free online resources that can be a good reference for you as you begin your investigations. Although this is put out by a California organization, most of the material is not state-specific. If you are new to legal research, this class teaches you methods such a looking for administrative law, finding codes and constitutions, and much more. Legal research may not be the most glamorous aspect of a paralegal position. However, being capable of conducting good thorough research can make you an invaluable member of any litigation team. Legal research is a skill that can help grow as a legal professional. Have you been considering a career as a paralegal? Are you thinking of getting a degree in Paralegal Studies? There are a wide variety of programs offered to prepare a paralegal for a career in the legal. You can find anything from a certificate program lasting several months, to a bachelor’s degree which requires four years to graduate. The courses are delivered in various ways. Some are on-campus classes, while others are offered online. There is also a lot of variation in pricing. The list that follows is by no means meant to be an exhaustive list of available programs. These are just a few we found to give you an idea of the differences in programs and pricing. 1) Liberty University offers an online certificate program and an online Associate’s degree in Paralegal Studies. The certificate program is 18 credits, totaling 18 hrs. The Associate’s program is a one-year program (if students follow the one-year completion plan). The program totals to 60 hours. Each credit hour amounts to $340. 2) Duke University is one of the top paralegal programs in the country despite not being an ABA-approved program (American Bar Association). Duke has been quoted to not apply for ABA approval because they do not know if it’s in the best interest of their students as it may change tuition costs. Duke offers a classroom-based program as a well as an online global program. The classroom-based program is in Durham, North Carolina. The Paralegal Studies Program is an intensive 300-hour course of study. It is a qualified program by the NC State Bar and graduates can apply for the Graduate Bar Paralegal Exam. Tuition is $5,395 (excluding costs of textbooks). The Online Global program teaches essential skills for paralegals. It is a 156-hour course of study. The tuition is $6,995 (excluding cost of textbooks). 3) Kaplan University – Maine Campus is one of the more expensive options at $66,780 or $371 per credit for a total of 180 credits. However, their Bachelor of Science courses in Paralegal Studies are intensive and they boast a 90% job placement rate upon graduation. Their retention rate may be on the lower side, but that could be due to a variety of reasons. Most graduates find work upon graduation and are even eligible to take the Paralegal Advanced Competency Exam (PACE). 4) George Washington University offers a 32-credit Master’s program in Paralegal Studies. For those who have already graduated from an undergraduate school and want to advance their degrees, GWU may be a preferred option. Classes are held online or at the Foggy Bottom Campus. Each credit costs $750. 5) Pace University offers a certificate program and boasts that students can complete it within five months. Students are taught applicable skills such as learning to use research engines such as LexisNexis and Westlaw. Students are also given “real world” assignments to prepare them for work. Tuition and further information is not displayed on the site, so prospective students will have to fill out their information on Pace.edu to request further information. 6) Los Angeles City College is an ABA-approved program. The objective of the school is to thoroughly prepare students in substantive and procedural law to complete any paralegal task in an efficient, professional, and ethical manner. The school only offers a 60-hour Associate’s degree. Since it is a city college, tuition is cheaper. Out-of-state residents pay $188 per unit and in-state residents pay through a determination of their expected family contribution and financial need. 7) University of San Diego is another ABA-approved program. They offer “day and evening classes, employment assistance, financial aid, and internship opportunities.” Full-time students (12-18 units) are charged a base tuition each semester. Tuition for the 2013-14 school year is $40,900 or $20,450 per semester. Part-time students pay $1,410 per unit for up to 11 units. 8) Long Island University’s Brooklyn Campus offers a 328-hour, non-credit certificate, ABA-approved program designed to prepare students to work at a law firm, a government agency, law department, bank, real estate company, and insurance company. This program offers a diverse background. Tuition is not based on credits, but program courses. Course tuition ranges from $110 to $825 per class. When comparing paralegal programs, be sure to speak to representatives of the school. Ask to also speak to current students and former students. Paralegals in your community are another helpful resource. Ask paralegals in your area for advice on how to choose a good paralegal program that is right for you. If you enjoyed this article, you might also like “3 Organizations That Could Help You Advance Your Paralegal Career”. A paralegal, also commonly known as a legal assistant, is somebody who carries out tasks assigned by their supervising attorney. Paralegals have many duties, some of which include assisting attorneys in their opening and closing arguments for trials, drafting pleadings and motions, and conducting legal research. Because the duties of a paralegal require an extensive working knowledge of the legal field, many firms will only hire individuals who are certified to be paralegals. Depending on prior education, paralegals can either pursue an associate’s degree, bachelor’s degree, or obtain a paralegal studies certificate. An associate’s degree in paralegal studies is a two-year program, typically, offered at a community or junior college. These programs combine paralegal and elective courses to create a multidimensional education. A bachelor’s degree in paralegal studies is a four-year program that is offered at colleges and universities. The bachelor’s degree programs require you to take paralegal courses, general education, and elective courses. While a bachelor’s requires more time, they normally are very worthwhile in terms of receiving a balanced, thorough education. In addition to your courses, you will also be required to complete an internship at a law firm. The internship is intended to give students real, working experience in order to prepare them in their career. But, for those who already have bachelor’s degrees, a paralegal studies certificate is their most viable option. It strictly consists of paralegal courses without the requirements of completing any general studies or elective courses. The National Federation of Paralegal Associations (NFPA). 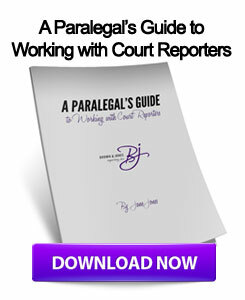 Another step that would help in your journey to becoming a paralegal is speaking to other paralegals. Other working professionals can share valuable insight on the career. You may learn how many hours they typically work or whether where they work is a high-stress, high-paced career. You may also gain insight on what firms are looking for when hiring new paralegals, which can put you at an advantage. Meeting other paralegals, either through internships or networking, can create lasting relationships that could potentially help you find a position. A recommendation from your internship supervisor could result in being hired upon graduation or certification. While being certified is not required to become a paralegal, it certainly helps. Many law firms would rather hire individuals who have been trained and certified to work in what is usually a fast-paced legal environment with little room for error. While it varies from firm to firm, many paralegals work over-time, with the rest of their colleagues, in order to meet deadlines and to finish large workloads. Working as a paralegal is a demanding position, but many paralegals find their profession rewarding. Individuals with an interest in the legal field, who possess strong writing, verbal, and organizational skills, may discover a career as a paralegal, very suitable. LinkedIn is the fastest growing and most powerful networking tool for professionals. Every year, LinkedIn is getting more powerful as more people begin using it to network. LinkedIn makes sense to business professionals and particularly paralegals as they are using it to network, acquire knowledge, get referrals, and more. LinkedIn Groups are becoming a powerful place to acquire new connections, meet people with like-minded interests, and share knowledge and information. Paralegal Network, with 20,894 members and counting, was created to expand the paralegal’s “network of people and ideas.” It is a very active group with frequent postings and interactions. The group forbids postings that advertise paralegal schools, blog postings, or any other forms of solicitation. Instead, postings are strictly limited to paralegal-related questions and issues. Paralegal Jobs & Continuing Education is a private group with a membership of 19,618 individuals. In order to join, you must submit a request to join. The purpose of the group is as explained in its title; to post paralegal jobs and continue your education as a paralegal. Paralegal & Legal Support Jobs (a subgroup of Law Jobs Network – #1 Legal Careers Group) is another private group. They boast a membership of 18,885 people. Job postings for temporary or permanent positions are frequently posted, ranging from paralegal, legal secretary assistant, virtual assistant, support staff clerks in corporations, law firms, government in-house banking finance, etc. Virtual Paralegal, a private group, with 1,040 members was created to serve individuals interested in becoming a virtual paralegal or already are. Here, they discuss trends, career and networking opportunities in order to help aid paralegals in their career. E-LEGAL, another private group with 90,449 members since November 21, 2008. It claims to be the #1 group for lawyers, attorneys, corporate in-house counsel, paralegals, law students, recruiters, etc. E-Legal is one of the largest groups for professionals involved in the legal field and is a great platform for networking professionals. Search LinkedIn’s Groups directory to find industry groups and networks to take part in. Once you have found several groups you are interested in, ask to join. The group’s moderator will approve your request and add you to the group. Once you have joined the group, you should get involved in discussions on a regular basis. This will allow you to continue to learn from others and continue to connect to more and more people. The larger your network is, the more useful it can be in the event you are looking for advice or information from others. If you liked this article, you might also like “3 Organizations That Could Help You Advance Your Paralegal Career”. Are you a member of a paralegal organization? If not, you may want to consider joining one. Being a member can be beneficial as you may find inside tips on job openings, networking opportunities, internship opportunities, and staying up to date on issues in the legal industry. You could join a local paralegal organization as it may help you connect with local professionals. Most paralegal organizations are affiliated with national organizations such as the National Federation of the Paralegal Associations (NFPA), National Association of Legal Assistants (NALA), and the American Bar Association (ABA). The NFPA has 52 paralegal associations. Membership benefits include discounts on NFPA Annual Convention rates, free access to the annual Joint Conference, and a free subscription to the National Paralegal Reporter Magazine. You can find a local member association near you on the NFPA website. The NFPA encourages individuals and representatives to become involved in the field on a national level. Members can raise issues for studies, research, and reviews through appointed coordinators and an ad hoc committee. At the conventions, members can democratically debate and vote on raised issues. Policy positions have to pass with a two-thirds vote in order to be passed. There are three types of memberships: individual sustaining membership ($47.50), military membership ($22.50), and student membership ($25). The other three types of memberships are for groups only: associate membership, organizational membership, and paralegal association. The other national organization to consider joining is NALA. NALA is a non-profit organization that provides continuing education and professional development programs for paralegals in all stages of their career. NALA represents 18,000 paralegals across the nation and sets professional standards of the profession. NALA even offers a certification program that has been running for 30 years. The organization’s continuing education programs also include publications, live seminars, and online programs. NALA, like NFPA, has a bi-monthly magazine that provides updated news and educational articles concerning various aspects of law. Membership dues are billed annually. Active member dues are $140 per year (20% discount for active military or active military reserve). Associate members are $150 per year. Student members are $50 for the first two years. And sustaining members are $115 minimum. Lastly, the American Bar Association, the third major organization that paralegals should think about joining is the most long-standing and well-known legal organization in the United States. ABA sets the standards for ethics and professionalism for the legal profession as a whole. Paralegals who have graduated with a degree from an ABA-accredited school are generally seen as highly qualified upon graduation. Joining the ABA can provide you a handful of resources to advance your career. Resources include educational, technology, and career resources. If you found this article interesting, you may be interested in “A Fast and Easy Way to Schedule Out-of-Town Court Reporters”.